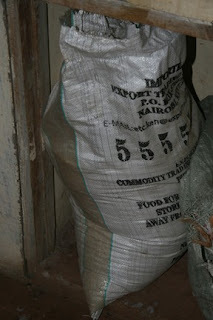 While we're ministering in Kenya, I thought you'd like to get a taste of Kenya our last trip. My husband and I recently returned from our fifth mission trip to Kenya. After twenty four hours of travel and a day in Nairobi we made the 6 hour drive to the city of Kisii (pronounced key-see), where we spent the night. 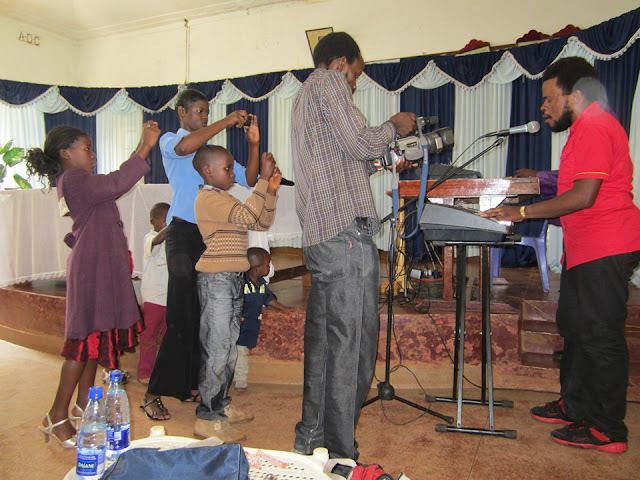 The next day was Sunday so we planned on attending worship at Mustard Christian Center (MCC) where our host is pastor. It wasn't until Sunday morning that we learned our team of six would be divided up and attending services in different locations, traveling with some musicians who would be in concert at MCC later that afternoon. Teammates Chris and Kim went to MCC as planned while Bob and Doug went to a service at a girls school with the musician named Anderson. This left Ali and I to go to Kisii University and IVC Church. There's nothing like heading off into the unknown with God as your safety net! We had no idea what would be expected of us, and I know Ali was very relieved that our role was limited to briefly introducing ourselves and participating in worship. Ali and I with musicians Daniel Tonino and Stella Nyanduko at Kisii University. Daniel is a Masai, a people group known for (among other things) their beadwork (his mother made his bracelet) and their ability to jump. 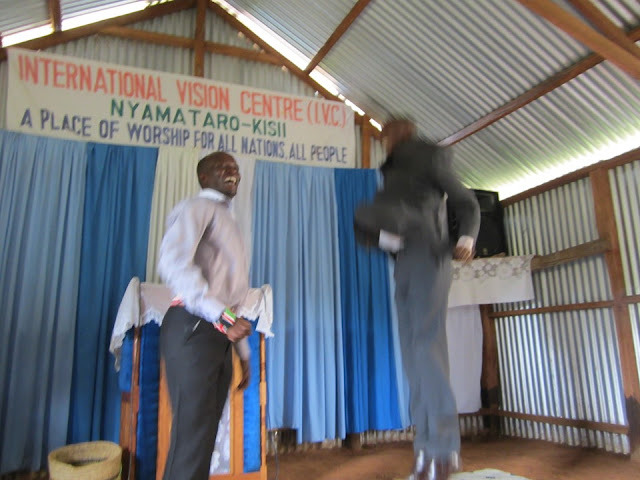 I wish I was able to capture a better picture of him jumping; he was clearing the pulpit! We started out at 9:00 a.m. and made our way back to MCC at noon where we were still able to catch the last two hours of worship. I had my first inkling that Anderson (in red) was not just your average musician when I saw a stream of people filing up to photograph him as he played. After the service, our team and all the musicians went to dinner at the home of Ezekiel and Irene, where more photography ensued. 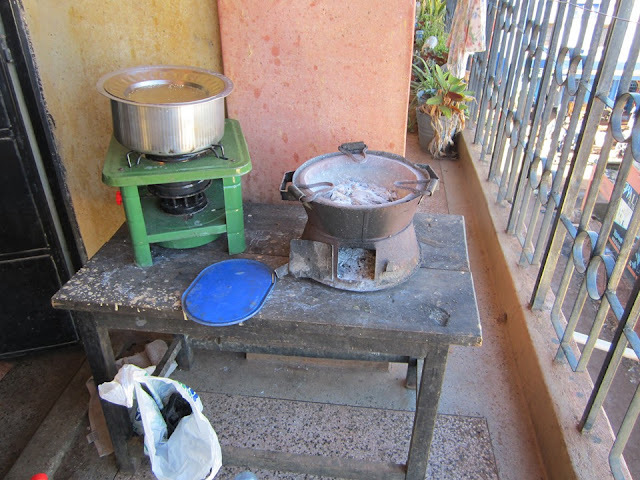 ... and most homes cook over stoves like these I photographed at our lodging in Kisii. Everything is cooked in a pot over a small burner and I've never seen a kitchen with more than two, which means cooking for anyone - let alone a large group - is quite an undertaking. Ugali (on the left) and green vegetable (on the right) are also found at just about every meal, including this one we were fed while building a house in the village. I have often heard it said that if there's no ugali, there's no food. Ugali is made of ground maize and water and tastes similar to field corn. Insulated serving dishes such as the ones shown above are necessary to keep the food warm since cooking is such a long process. Many of the foods, such as boiled bananas or potatoes, have to be peeled and sliced before they can be cooked, another time-consuming task. Surprisingly these two food taste remarkably similar (the bananas used are green). When served mashed, the only way I could tell the two apart was by the appearance of the small banana seeds. 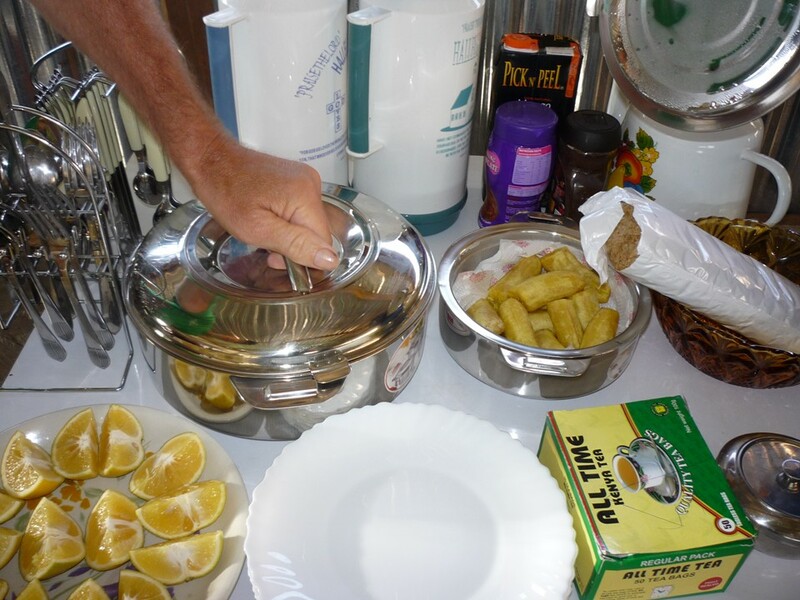 Running water was not always readily available, even in the city, so it was not unusual for our hosts to bring around a pitcher of warm water and a bowl to catch it in. "Keep on loving each other as brothers. Do not forget to entertain strangers, for by so doing some people have entertained angels without knowing it." Our hosts weren't entertaining angels, but they were seeing stars. 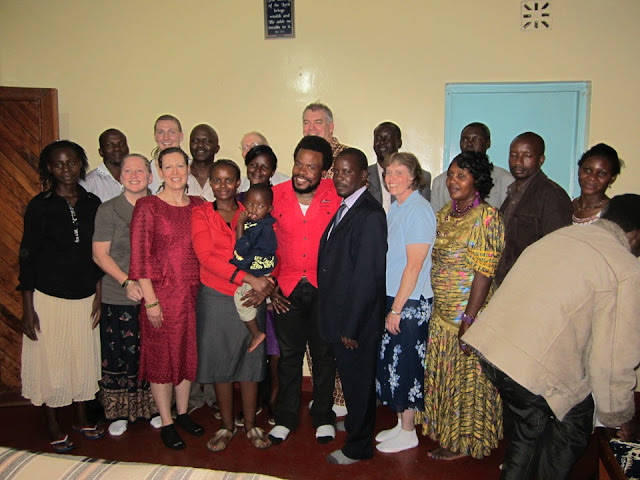 They thought they were just entertaining our group from the U.S. and a some Kenyan musicians but unbeknownst to them, among their guests was one of their favorite celebrities. Ezekiel and Irene mentioned on more than one occasion that they couldn't believe the people they watched on TV were now in their living room. We learned the person we knew as Anderson is better known as Man Ingwe, a producer and music icon in Kenya. To translate it into American terms, it would be as if someone like Stephen Curtis Chapman or Mandisa showed up with their entourage in your living room. Lord, I thank you for the incredible hospitality shown to us while we served in Kenya. Everyone went above and beyond. Thank you for the joy of witnessing the surprise blessing this family received through their service to You. Here's one of Anderson's videos. The language is very much like that we encounter in Kenya - a lot of Kiswahili with a little English here and there. The song, entitled "Wrong Number" is basically about a man who calls a phone number he believes belongs to God and through the conversation comes to know Jesus. 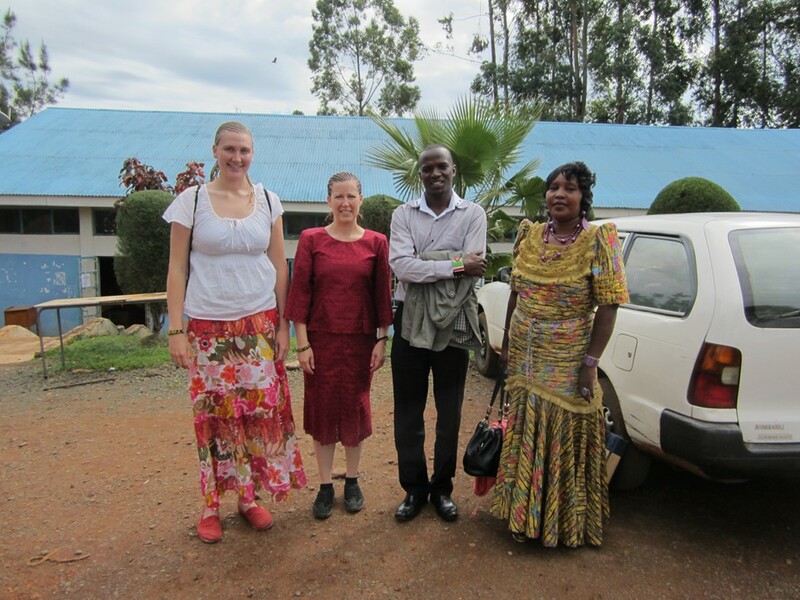 Thank you for sharing this wonderful mission trip to Kenya at Tell me a True story. God grants surprize blessings just for fun upon those who were ministering to YOU. Thank you for explaining the proceedures for cooking and I can understand why it took so long to prepare. They were amazing hosts too! God is so good! Reminded me so much of my times in Uganda. Much of the same food, of course, and just about every other photo made me feel as if I was "home". Only been in Kenya during the coming-and-going times, but had more intentions and less opportunity to fit them in. However, hope you had a great and blessed time. Touching and encouraging them is a huge blessing for them; they face so much. Thanks. in seconds! Thank you for sharing ,these great pics and about your mission, It sounds like blessings for both your team and those in Kenya as well!